As was outlined at the CPA Leadership Summit held in Ottawa last June, the CPA is examining possible opportunities for creating partnerships with Indigenous and remote communities that would see both environmental and economic benefits. The association is looking at developing a pilot project that demonstrates the propane advantage and creates partnerships between Indigenous communities and the propane industry that result in low-emission propane replacing diesel and heating oil for home energy. Unique opportunity to connect with Indigenous leaders and government! The CPA is exploring the opportunity to participate in the upcoming Forward Summit: Empowering Indigenous Communities taking place in Calgary, Alberta February 26-28, 2019. On November 29, the Ontario government released its plan for the environment, Preserving and Protecting Our Environment For Future Generations: A Made-In-Ontario Environment Plan. The CPA responded by issuing a news release applauding the government’s push to remove unnecessary provincial regulations. While the CPA believes that the intent of the Ontario government is to provide Ontarians with real energy choices, allowing natural gas utilities to subsidize expansion through taxing existing customers is not a fair market-based approach. Pursuing this course of action amounts to supporting a corporate subsidy that will increase costs in the long run and ultimately will not be financed by private money but rather by Ontario’s natural gas customers. On November 6, CPA's Atlantic Government Relations Director Jean-Francois Duguay and Vice President, Government Relations Allan Murphy met with Hon. Derek Mombourquette, recently appointed minister of energy and mines, to discuss the propane advantage in Nova Scotia. The minister was joined by his Deputy Minister Simon d’Entremont. The CPA, represented by Government Relations Director for Atlantic Canada Jean-Francois Duguay and VP of Government Relations Allan Murphy, attended the Nova Scotia Federation of Municipalities 2018 Fall Convention in Halifax, November 6-9, 2018. The CPA wishes you all a safe and happy holiday season. Thank you to all our sponsors who supported our activities and events in 2018. Your support is much appreciated and contributed to a very successful year. We look forward to working together in 2019. The CPA offices, including the Propane Training Institute, will be closed from December 24, 2018 to January 2, 2019 inclusively. The CPA teams looks forward to working for you in the new year! CPA and ERAC members that have completed their online membership renewal forms can expect to receive their confirmation email with the invoice by December 10. We would like to thank members for their continued support for, and investment in, a successful and thriving propane industry. If you have not yet completed your online renewal form, please make sure to do so before Friday, December 7 to ensure you are renewed for 2019. The CPA sent out a Readership Survey last summer to gain a better understanding of how the association is currently meeting members’ needs and what we can do to improve our services. Check out these great career opportunities with the CPA! CPA member referral bonus - $200 discount on fees! The CPA reminds members that they will receive a $200 discount off their annual membership fees for referring an organization/individual that joins the CPA. There is a maximum of $400/two referrals per member, per year. 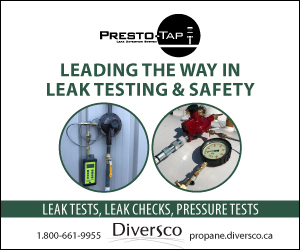 Contact Igor Minic at igorminic@propane.ca for more details. On November 21, Federal Finance Minister Bill Morneau updated Canadians on the state of the national economy when he released the Fall Economic Statement (FES), which highlights the government's economic policies and lays the groundwork for the next Federal Budget. The CPA has issued a news release, Be prepared for unpredictable winter weather, to remind residents to be ready for the upcoming colder weather, despite Environment Canada’s predictions of a milder than normal winter. The results of the November 14, 2018 greenhouse gas (GHG) emission units auction held jointly with the California Air Resources Board (CARB) are now available. During the holidays, the ERAC office will be closed on the following dates: December 24 (afternoon only), 25, 26 and 31 (afternoon only), 2018 and January 1, 2019. As always, the ERAC Emergency Call Centre (1-800-265-0212) will be available 24/7 throughout the closures. Happy holidays from the ERAC team! ERAC would like to thank the following ERAC Plan Participants for their sponsorship of locations and product during the 2018 training events. Donations ensure that ERAC can provide the most comprehensive, cost-effective training to not only ERAC trained and assessed response teams, but also to first responders across Canada through ERAC’s LPG Firefighting Level 1 training program. The CPA continues to work on improving our training services. We have a few items to update you on: our code of conduct and new PTI manual feedback support.